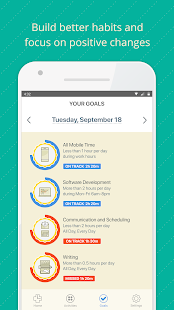 RescueTime for Android is an automatic productivity and time tracker that helps you understand and control the time spent on your Android device. Get rich insights into how you spend your day, build better habits, and beat distractions. 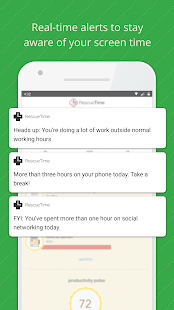 Whether you want to cut hours or minutes from your daily screen time, RescueTime for Android can help. 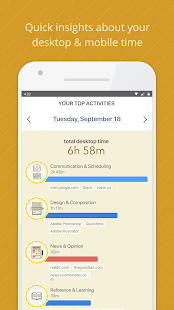 Get an accurate view of how much time you’re spending on your Android device each day and then set custom screen time goals based on your personal targets. We’ll notify you in real-time if you go over. Screen time isn’t the only factor in creating a healthy balance with your digital devices. Want to spend more time writing and designing? Lower your time spent on social media? All your RescueTime goals are front and center in the Android app, so you can get a quick view of how you’re doing and stay on track. Get a clearer picture of how you spend your time by logging offline time—meetings, phone calls, lunch breaks—directly from your phone. RescueTime’s FocusTime feature allows you to block distracting websites when you need time to focus. 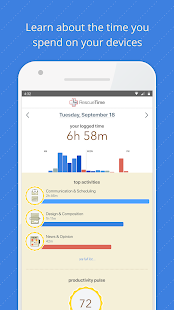 With RescueTime for Android, FocusTime sessions automatically put your phone in do-not-disturb mode so you’re protected from all digital interruptions. RescueTime Lite is free forever. However, for even more control over how you spend your time, you can upgrade to RescueTime Premium for £6.92/month or £55.37/year. FocusTime distraction management: Block distracting websites on desktop and put your phone in do-not-disturb mode when you need help staying focused. RescueTime offers full support of the paid and free subscription. Just log in to our website at www.rescuetime.com and click "help" in the top right corner, then "start a discussion" to create the ticket. You get direct engineer access! Please, before you rate us, give us a chance to help you! If you have ANY issues or questions, please contact us via the help system, or send email to support@rescuetime.com and give us a chance to help you. We happily extend Pro trials if your setup has any issues.